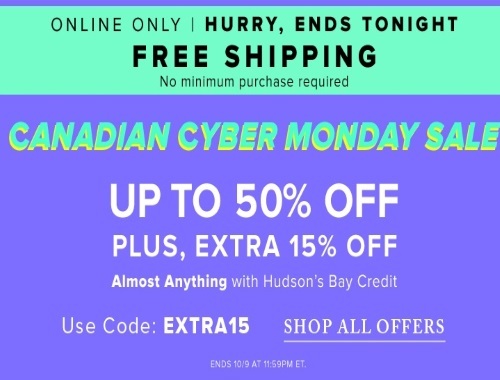 Hudson's Bay has a Canadian Cyber Monday Sale today! Save up to 50% off plus get an extra 15% off on almost anything when you pay using your Hudson's Bay credit. Prices are as marked online. Enter the promo code EXTRA15 at checkout. Free shipping applies on all orders too with no minimum. Offer is valid online only today, Monday, October 9, 2017.